Opponents of Petrobras drilling off East Cape have been labelled Luddites. This month is the 200th anniversary of the British Luddite protests and I appreciated Mark Engler‘s exploration in ‘Dissent‘ magazine of whether or not those demonstrators of old should really be described as anti-progress. The Luddites did not oppose technology per se, but rather asked some important questions about the ends to which new technological discoveries were being used and who in society would benefit from them. The original Luddites were neither opposed to technology nor inept at using it. Many were highly skilled machine operators in the textile industry. Nor was the technology they attacked particularly new. 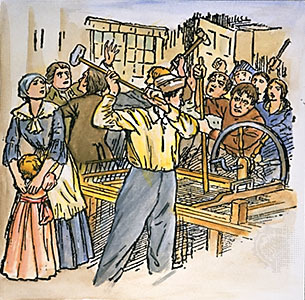 The Luddite disturbances started when British working class families at the start of the 19th century were enduring economic upheaval and widespread unemployment. The war against Napoleon had ‘brought the hard pinch of poverty to homes where it had previously been a stranger’. Food was scarce and rapidly becoming more costly. Then, on March 11, 1811, in Nottingham, a textile manufacturing centre, British troops broke up a crowd of protesters demanding more work and better wages. That night, angry workers smashed textile machinery in a nearby village. Similar attacks occurred nightly at first, then sporadically, and then in waves, eventually spreading across a 70-mile swath of northern England. Fearing a national movement, the government positioned thousands of soldiers to defend factories and Parliament passed a measure to make machine-breaking a capital offense. As the Industrial Revolution began, workers naturally worried about being displaced by increasingly efficient machines. But the Luddites themselves were totally fine with machines. They confined their attacks to manufacturers who used machines in what they called “a fraudulent and deceitful manner” to get around standard labour practices. They just wanted machines that made high-quality goods and they wanted these machines to be run by workers who had gone through an apprenticeship and got paid decent wages. Those were their only concerns. Ironically opponents of oil and gas exploration in the Raukumara Basin are calling for more investment in clean technologies like solar and electric vehicles to replace our reliance on old technology. Arguments about technology (much like those about deep sea oil and gas drilling) often come down to legitimate debates over values. I would like to see some more discussion on competing values in the current debates on mining in this country. Manuka,.. Nice response there! & you the mostist techno savvy bro I know… tho’ coming from me it aint much of a call. Do got wireless now tho’. Keep up the good mahi there e hoa. Really like that “You give Ludd a bad name”.. Good alright. Keep those beautiful Coastie beaches clean & get that flipping bark outa the water too..What the heck!